2mm North East Area Group: Corporate Blue Diesels..................! 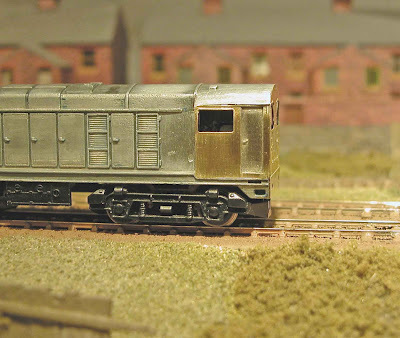 This Class 20 locomotive ran on my very first 2mm Fine Scale layout 'Little Wansbeck' during 1983/4/5. It has now re emerged on to the scene and as you can see is sporting an etched brass cab. A lot more realistic than the original Farish jobby. There isn't much happening to the this particular model at the moment, apart from Bob having etched and fitted a complete cab replacement for it. There are lots of etches available. It was Edward who asked Bob to do the replacement etches and as he doesn't do diesel Bob asked if I had one of these 'blue boxes' (not his words..!). Well it seemed only right that since Bob was doing the design and he would need a locomotive on which to test out the product that I should volunteer mine....! So not only do I get a set of test etchings - I don't even have to fit them to my locomotive. The result so far is not perfect, but that has more to do with the original Farish product and my cutting up of it than the etch design, particularly around where the cab roof meets the cab side. How many more Class 20's out there looking for a face lift? This one is eventually going to end up with a new motor and a decoder. Am I right in thinking that the cab roof hasn't been replaced? When I did my Cl20, I used the Taylors ends and fabricated new sides from 5thou plasticard to overlay the mazak casting (once I had filed the windows oversize). I seem to recall that I had to reprofile the cab roof to get a passable model. Now a complete Cl20 body kit; that would be worth having! Oh are you going to tweak the running plate at all? I've always liked the class 20's.. if a decent kit was ever produced I would like Tony be interested.